As most of you know, Kaspersky is one of the best Anti Virus security suite available to protect your system. But sometimes, we need to uninstall Kaspersky products due to one reason or the other like in situations like a system crash, change of antivirus or evenÂ the antivirus or internet security getting crashed etc. Today we will talk about a small step which will not remove the product activation from your system while uninstalling it, so that whenever in future you want to install it back, you need not activate the product again which sometime cause problems due to restriction on number of activations that’s possible on a single key. 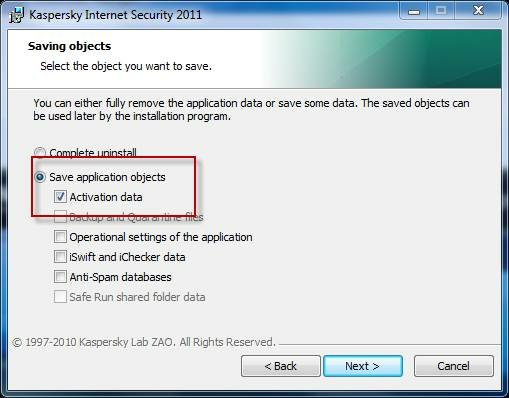 Whenever you do a uninstall of Kaspersky product like Antivirus or Internet security, you are give options of either doing a full uninstall or a custom uninstall saving some portions of the product. You just need to select Save application objects >>Activation data to save your product activation data. By doing this small thing, your product activation data will remain on your system and next time when you decide to install it back, it will be activated automatically using that data.